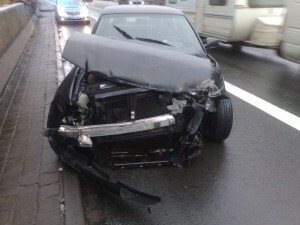 Almost two weeks ago I had a car accident on my way to a client. Despite driving with regular speed and considering myself a good driver, I managed to smash against a wall on the “Autobahn” with 120 km/h after experiencing the danger of “aquaplaning”. Yet everything is still aching and my brain had to reclaim it’s space in my head during the last week but appears to be operational again. Previous: Previous post: iTunes sync with Linux on unjailbroken 2.0+ iPhones/iPods? -aber hallo! Traurig, das mit dem Unfall zu hören aber wenigstens Glück im Unglück.